Vendor Managed Inventory is defined as the task of generating purchase orders to replenish a customer’s inventory. VMI is about noticing of a demand and product flow in a supply chain, facilitating a more timely and accurate replenishment process between a supplier (vendor) and an inventory site (customer, distributor, distribution center, etc…). Key feature of the e-commerce layer is that the data be timely and accurate. The real world implementations of VMI can be broken into three main categories: collaboration, automation, and cost transfer. By collaboration, we mean sharing data, and jointly developing forecasts and/or production schedules amongst supplier chain partners which occurs at the strategic or item level. The ‘buyer’ collaborates with the supplier on demand/usage plans in order to develop a consensus forecast of future demand that both companies will use to drive their business. A Fully Automated replenishment model combines the positive elements from the other two models with a more comprehensive goal of total supply chain cost reduction for the replenished site and supplier. 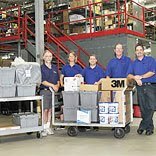 With goals established for inventory performance (turns) and service (fill rate), the VMI software develops the replenishment strategy at the micro level (SKU level) to achieve the established goals at the lowest total cost. Execution against the replenishment strategy is done automatically based on the daily changes in inventory and demand at the replenished site. Inventory is the substitute for information. In the absence of timely and accurate data, each node in the supply chain compensates for the lack of information with inventory. Not only does poor information flow build supply chain inventories, but it also restricts each company’s ability to react to increases in demand, causes extended outages, service interruptions and lost sales. As actual demand for products is disseminated up the supply chain in a more real time environment, the more closely aligned production is with demand. As the gap between production and demand diminishes, so does supply chain inventories and service level interruptions. The ultimate goal is supply chain excellence, as defined by service, speed and cost. Delivering the best service at the point of consumption in the least amount of time at the lowest total cost. The result is a supply chain that has an automated, timely flow of information triggering replenishment activities that anticipate demand accurately. Done effectively, VMI delivers tangible results throughout the supply chain. As the concepts and practices of ‘lean’ extend beyond the manufacturing floor down through the supply chain, VMI is the enabling process to drive out costs and time.